Willard Wirtz Dies; Was Last Surviving JFK Cabinet Member : It's All Politics Willard Wirtz, Secretary of Labor under Presidents Kennedy and Johnson, is dead at 98. He was the last surviving member of the JFK Cabinet. Willard Wirtz, the secretary of labor under Presidents John Kennedy and Lyndon Johnson, died Saturday. 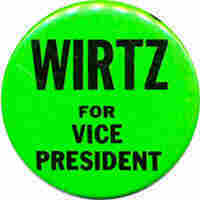 Wirtz, who was 98, was the last surviving membr of the Kennedy Cabinet. A Chicago labor lawyer and adviser to Adlai Stevenson, Wirtz was named under secretary of labor in the original Kennedy Cabinet in January 1961. When JFK nominated Secretary of Labor Arthur Goldberg to the Supreme Court in September 1962, Wirtz moved up a day later. At the Labor Department, he took an activist role in fighting to help the poor and the unemployed. He stayed through the end of the Johnson administration, though he irked LBJ by speaking out against the war in Vietnam. In 2008, he was the subject of an NPR interview by Scott Simon, which you can hear here.